Thank you very much for your time and consideration of my product design and development known as Hotrock BBQ. 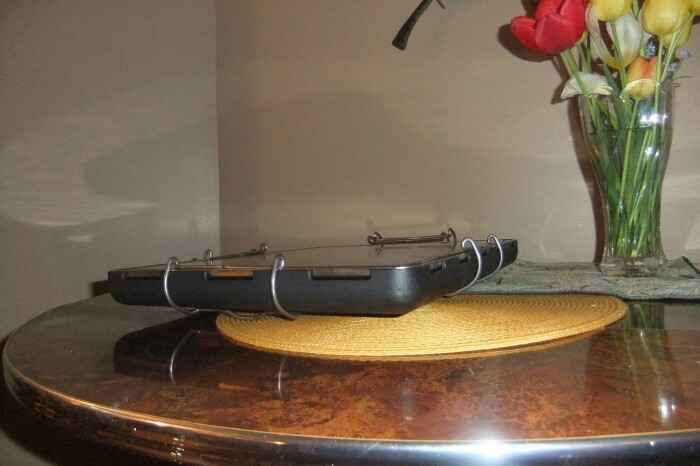 It is a two piece tray that retains lava rock and is secured with 4 clips that hold everything in place. The top piece is of cooking grade stainless steel and the bottom piece is made from top quality drawn aluminum that has a very high resistance to heat. It is very durable and built to last. It is the only griddle that I know of that is environmentally sustainable. With the product in a barbecue you can cook anything you can imagine because aside from griddling it will transform the barbecue into an oven. Please find below a couple of you tube links showing the product being set up and cooking. The face book link will allow you to view stills of many other foods that have been cooked with the product. Currently the product is in the market ready and patent pending prototype stage. There is a provisional patent application in process with the USPTO (62195135)and also a 400 page Intellectual Passport Copyright Business book about the product and ideas registered with the Canadian Patent Office. This offers dual intellectual protection. The product can be produced and packaged for approximately $50.00 Canadian and retail at approximately $150.00. These prices may be subject to change. The product offers brand expansion commercially, residentially and possibly institutionally. There is currently no web site, There is a patent pending number for a provisional patent application that is on record at the USPTO the number is 62195135. There is also an unpublished book called "Evolution of Heat Transfer" registered with the Canadian Intellectual Patent and Copyright Office. The registration number is: 1088014. BBQ HOT ROC I consists of a container or tray made from aluminum foil, heavy gauge aluminum, copper, stainless steel, tungsten or titanium all of various gauges filled with a measured amount trap rock (approximately 5/8” deep). It could also be filled with a number of other compositions of matter with heat-transfer capabilities, including refractory cements or mixtures thereof. It is then simply covered with a sheet of aluminum foil wrap, which acts as a drip tray and discarded after each barbecue experience. A new sheet of aluminum is used after each barbecue session to avoid messy cleanups. The aluminum wrap will act as an elevated dam surrounding the outside perimeter to retain drip fats, juices and food particles from falling into the flames while covering and protecting the trap rock. BBQ HOT ROC I is a revolutionary new cooking accessory created to have the capability to convert cooking appliances to cook similar to convection ovens and infra-red barbecues for less cost. This in turn will provide consumers with greater flexibility, superior cooking and save time and money. BBQ HOT ROC I must be used and handled according to the provided instruction pamphlet in order for the desired results to be obtained through out the cooking process. BBQ HOT ROC I properly used will reduce flash fires and flare ups. BBQ HOT ROC I can be manufactured to fit most sizes and shapes of barbecues currently available on the market. After being properly placed on the barbecue BBQ HOT ROC I is heated up at high temperature for approximately 5 to 10 min with the barbecue lid closed. Once maximum temperature has been reached the barbecue is turned down to minimum heat range for the duration of the cooking process without worry or concern of flash fires or flare ups while you can enjoy time with family and guests. BBQ HOT ROC I will retain the heat throughout the cooking process, saving expense on gas. This will also grant barbecues greater longevity and will help keep the components much cleaner than regular use. BBQ HOT ROC I conserves energy, reduces greenhouse gas emissions and is recyclable with minimal waste and is vital to meeting and sustaining environmental standards. It is transportable and will be manufactured in various shapes and sizes as market supply demands. A conventional gas-fired barbecue as shown in the drawing, has a rectangular open fire box 1 with gas burners facing upwards 9. The side walls 5 and 7 are formed with an extending flange 13 on which an edible grill 15 is supported. The entire bottom unit is covered by a hinged lid 17 that can be opened and closed during cooking. Intermediate the top of the burners 9 and the upper rim of the fire box. where side extending flanges 21 protrude, a heat deflector 23 which are also burner protection guards, supports the container tray of the BBQ HOT ROC 1 25. The top portion of BBQ HOT ROC I is a drip tray attached to the container. It has an elevated dam 18 around its outside perimeter and its objective is to catch and retain fats, juices and other debris from the edibles that may fall through the food supporting grate 15. A measured amount of trap rock 27 (5/8 “ deep) as seen in Fig. 2, fill the container 25 that has a lip designed to place the drip tray over the top of container 25 leaving a determined space for the heat to transfer throughout the fire box 1. The purpose of the aluminum, copper, stainless steel or titanium container is to be a heat conductive transfer device that retains the heat throughout the cooking process. Another purpose is to vaporize and produce smoke from the heat and add flavour to the edibles, thus reducing carcinogens from burnt food. 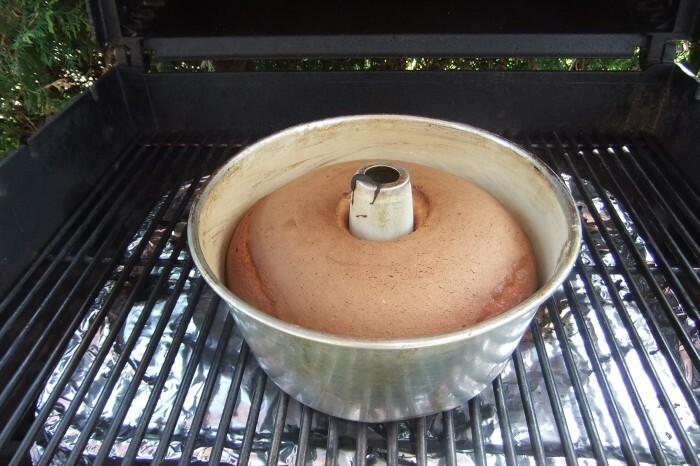 Another purpose is to protect the burners and other components from damaging grease and debris from the edibles allowing, greater longevity of your barbecue. Note: The heat transfer composition of matter could be of any number of various types available either as stand alone or in a cementeous mixture of refractories or any combination thereof. Over time, my research concluded the trap rock to have superior qualities over the other compositions of matter. Any of the various metals of cooking grade quality in various manufactured forms could be used in the construction of these products either in whole or in part. Is a variation of BBQ HOT ROC I, in which is a single solid refractory slab is poured into a non-stick coated metal mould (aluminum, stainless steel of any quality, copper, tungsten or titanium). As well as a mould, it serves as the shipping container and when BBQ HOT ROC II is removed from the mould it is inverted on top of the barbecue and becomes the drip tray that catches and retains the fats, juices and debris from the edibles. The BBQ HOT ROC II is created from a formula of water, cement fondue and trap rock. It could also be from a number of other compositions of matter with heat-transfer capabilities, including various refractory cements and/or mixtures thereof. The invention provides a solid heat-retaining refractory slab that radiates heat throughout the cooking process. The non-stick coated tray can be removed and cleaned before each barbecue experience and be replaced and used over and over again. 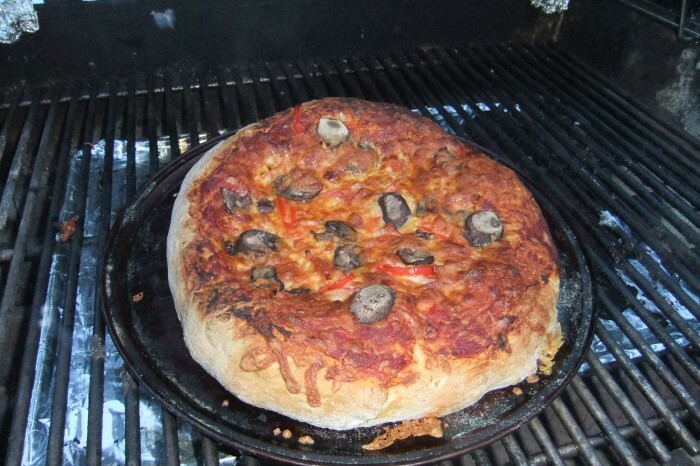 The invention works best in gas fired barbecues, but can be used in charcoal barbecues also. Further research and development may prove it to be useable in other cooking appliances. The stainless steel mould has superior quality as well as more versatility. BBQ HOT ROC III is very similar to BBQ HOT ROC I with the main differences described as follows: the tray is manufactured of a heavier gauge of aluminum/copper/ stainless steel/titanium of cooking grade integrity. They could be made of with a non-stick surface from any of the numerous types available. It will consist of two pieces. The base tray container will be filled with a pre-measured amount of trap rock (5/8 in. deep), and the drip tray will have elevated walls all around the outside perimeter to be approximately 1/8 in. larger than the perimeter of the base container. The drip pan placed immediately over the base container will protect the trap rock from contaminants. Designed cross-members on the bottom of the drip tray will allow for safely securing the assembled unit with a space designed for air to flow freely, aiding the cooking process within the barbecue’s fire box. BBQ HOT ROC III has superior qualities and at an affordable price and will compete with any other product currently available on the market. BBQ HOT ROC IV is a re-design of BQQ HOT ROC III, but with a dual purpose. It will function as a heat-transfer device with a drip tray and a griddle cooking surface. The drip pan/griddle will have a re-enforced cross member welded on the bottom that allows it to be placed directly on a designed ledge in the bottom tray. 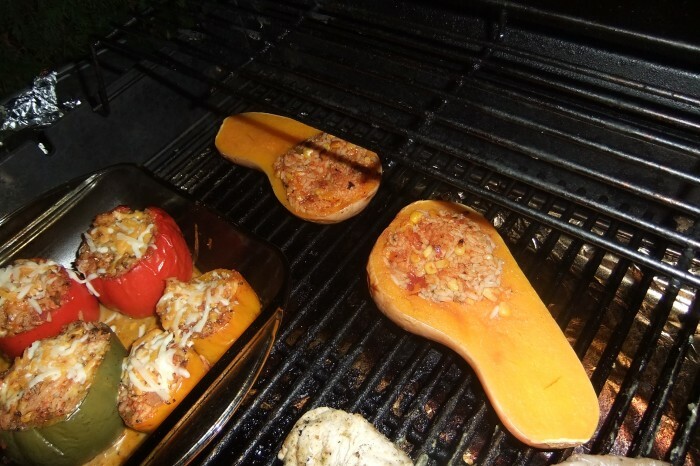 When used as a griddle, the tray, which could be made with a non-stick surface, will be placed directly on top of the food grate of the barbecue. The drip tray/griddle will have a designed trough on the front so as to retain fats, juices and food residue and protecting the bottom tray from becoming contaminated. This in turn will virtually eliminate flash fires and flare-ups. The BBQ HOT ROC IV is the best model of the series so far, as it has superior qualities and will compete with any barbecue accessory currently available in the market place. 1- BBQ HOT ROC was invented for use in cooking appliances, including gas ranges, electric ranges, restaurant appliances and barbecues. 2- When BBQ HOT ROC is used as instructed, it is a superior conductor of heat and creates a convection process, similar to a household oven, distributing the heat evenly and allowing a much more consistent cooking process. 3- This innovative cooking process will result in better tasting foods, as it locks in all the flavour and juices of your favourite foods. 4- BBQ HOT ROC allows most foods to be cooked with minimal supervision and greatly decreases chances of burning any foods (even a whole turkey will cook nice golden brown, with juicy flavour). 5- BBQ HOT ROC offers a healthy choice in that it virtually eliminates flare-ups, making cooking safer, while greatly reducing the risk of carcinogens in the cooking process. 6- BBQ HOT ROC is rugged and durable and cleanup is simple and easy. 7- BBQ HOT ROC will reduce green house gas emissions. 8- BBQ HOT ROC will give your cooking appliances and their components greater longevity. 9- BBQ HOT ROC when used as directed will make your barbecue the most versatile cooking appliance you own: it can also be used as a griddle, it enables to cook as a slow cooker and it can be used as a steamer or as a smoker. 10-BBQ HOT ROC can even be used over an open camp fire with a properly set up grill. 11- BBQ HOT ROC can also be used to convert older cooking appliances to gain all the benefits of a new cooking appliance. 12-BBQ HOT ROC will conserve gas and/or electricity, normally used for cooking. 13- BBQ HOT ROC is recyclable with minimal waste. 14-BBQ HOT ROC may be eligible for carbon credits in the future. 15- Your cook wares are safe to use with BBQ HOT ROC. 16- Additional products will be manufactured utilizing the same heat-transfer “composition of matter” and will comply with all or part of the aforementioned benefits, but the sizes and shapes will be adjusted to accommodate various new applications. The concepts of my creations are all heat-transfer devices that can be made from any metal combined with any mixtures of various compositions of matter, to obtain cooking grade devices to perform cooking processes fit for human consumption. They can be made in any shape, form or size, adapted to or fit in any cooking appliances, for use both indoors and/or outdoors. I acquired an ‘Intellectual Passport Copyright Business’ (IPCB), which is a 400-page book that contains a literary rendition of my creative concept, identifying me as the sole inventor, a detailed description of the products, including instruction for use, a professional business forecast expressing intent to commercialize my innovation and lastly a complete set of contracts allowing me to extend commercial rights to third parties. The IPCB was developed in Europe by USD-System Editions (Universal Strategy Development System) and they have been available since 1995 (SOSinvention.com). The IPCB was registered with CIPO Registration No. ........ on .......... and is protected under Universal Copyright Laws, granting legal ownership of the way the invention is expressed in 184 countries. Copyright forbids third parties to copy all or part of my IPCB for commercial purposes, whether it pertains to descriptions, designs or images; even slight variations are not permitted. The USD Consortium issues a certificate of guarantee, stating that the IPCB cannot be invalidated. Trade-marks for the name ....... have been applied for. payable in 3 portions of 40%-30%-30%). Reminder: PCT or worldwide patent costs US$ 350,000!! responsibility for the validity of the principles that created the IPCB in a Court of Law! - no applications, no legal costs, no objections, no translation costs, no maintenance fees! - most countries respect and honor international copyright legislation over national patent legislations. - it is in compliance with Articles 1 and 27 of the Universal Declaration of Human Rights, which trumps every national law. - it contains several rights: patrimonial, ownership, exclusive commercial, moral. - a movement to liberalize and allow strong, affordable and universal access to IP, rather than discouraging inventors with a weak, costly, fragmented and indefensible system, issuing undefendable patents and thereby impeding and encumbering innovation and ultimately progress. - it incorporates a professional business forecast, corroborating the inventor’s intent to seek financial reward. e all other information, pictures and drawings available upon request. The product offers brand expansion commercially, residentially and possibly institutionally. there are a number of other product ideas available for brand expansion to increase the product line. This product has never been sold and is not on the market. The market is global with three business plans of best, probable and least amount forecasts. In North America the market is approximately 4.2 billion dollars annually. There are approximately 15 million barbecues shipped annually with approximately 135,000,000 barbecue units in use in North America. The industry growth rate is between 5% and 7% annually. There is a trade mark of one of the logos and one that is not registered but I am currently using. I have a 400 page book registered with the Canadian Intellectual Property Office with all of my ideas, photos, business plans, contracts etc. in it. Also it has a patent pending. I am open to a licensing contract, patent assignment or a combination of both. Page created at 2019-04-25 14:03:10, Patent Auction Time.